On Tuesday 25th August 2015 I attended the launch of a new museum display about the 35 men from Gilgandra who enlisted in the Gilgandra to Sydney Coo-ee March, at the Coo-ee Heritage & Visitor Information Centre at Coo-ee Memorial Park, Gilgandra. 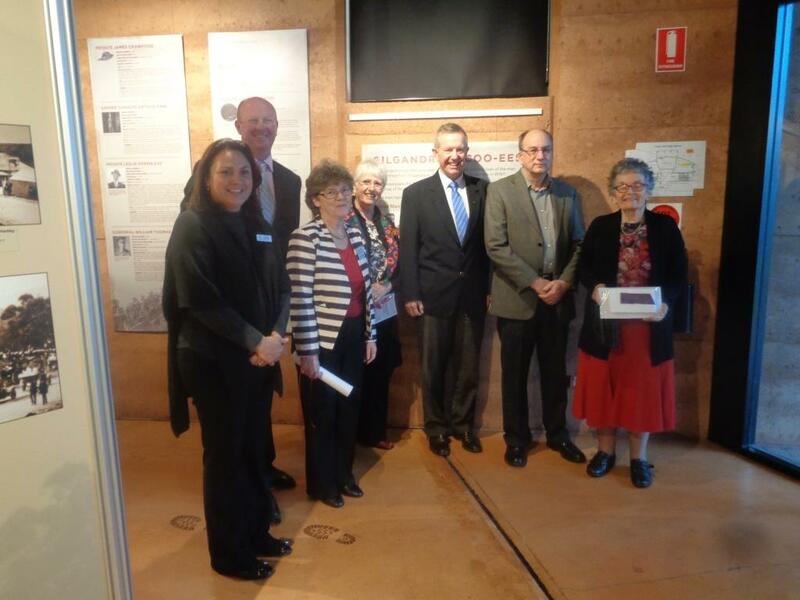 The new display was officially opened by Mark Coulton MP, Federal Member for Parkes. Pictured from left to right in front of the new display panels, which feature information on each of the 35 Gilgandra Coo-ees, is Gilgandra Shire Council Cultural Officer Kylie Moppett, Acting Mayor Cr. Ashley Walker, Gilgandra Museum & Historical Society curator Shirley Marks, Gilgandra Museum & Historical Society member Margo Piggott, Member for Parkes Mark Coulton, and Graeme Hosken and Mrs Imelda Silva. A book titled ‘Gilgandra’s Coo-ees’ that was compiled by Margo Piggott to support the new display, which provides information about each of the 35 Gilgandra Coo-ees, including a photograph of many of them, was provided to the large number of people who attended the launch. Also during the launch, Mrs Imelda Silva, with her nephew Graeme Hosken, donated an original purple “Coo-ee badge” ribbon to the Coo-ee March Gallery collection, which will make a valuable addition to the collection. This ribbon had been obtained by the family at the time the Coo-ees stopped at Eastern Creek in Sydney on 10th November 1915 during the Coo-ee March and was kept in the family’s autograph book. 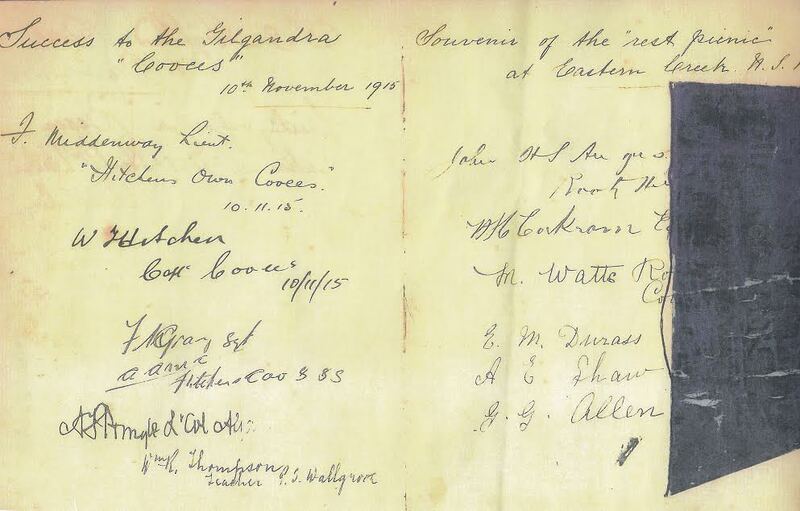 A photocopy of the signatures that were written in this autograph book on this same day, which includes Bill Hitchen’s signature, was also donated to the Coo-ee March Gallery collection. What were these “purple badges” that the Coo-ees had worn on the Coo-ee March? It was amazing to see the purple ribbon in such pristine condition – I could still see the sprinkles of the silver paint used for the lettering on the ribbon. Researching the purple badges worn by the Coo-ees further, I found that at Euchareena the ‘school children ran races for Hitchen’s “Coo-ee” badge’. At Molong over a pound’s worth of “Coo-ees” ribbons were sold for a shilling each to raise money for the march. The Leader reported that the Coo-ees wore their purple badges pinned to their shoulders when they marched through Orange. The rolls of ribbon for the Coo-ee badges had been supplied by Wises’, Ltd., in Sydney. So, along with the ones worn by the Coo-ees, and these additional ribbons that were sold and given away during the march, there were hundreds of them in people’s possessions at the conclusion of the Coo-ee March in 1915. I wonder how many other Coo-ee badge ribbons are still in existence 100 years after they were worn on the Coo-ee March, hidden away in a family member’s First World War memorabilia tin or box, or in a photo album or scrapbook? ‘The Coo-ees. Gilgandra Men in Sydney’, The Sydney Morning Herald, 13 November, 1915, p. 19. ‘With the “Coo-ees.”’, Gilgandra Weekly, 29 October 1915, p. 2. ‘The Route March’, The Farmer and Settler, 26 October, 1915, p. 3. ‘Hitchen’s March to the Sea’, Leader, 25 October, p. 4. ‘Gilgandra Recruiting Association’, Gilgandra Weekly, 26 November, 1915, p. 4.